The following is an example of a curriculum vitae (CV) used for applying for jobs in the United Kingdom. In other regions of the world, employers often require job candidates to submit “CVs.” However, international CVS are actually quite different from U.S. CVs. In the United States, CVs are used in specific industries, such as academia, scientific research fields, and the medical profession. They are often longer than traditional resumes (beginning at 2-3 pages for entry-level candidates), and are meant to emphasize one’s academic and professional background and credentials. CVs in other countries are more similar to U.S. resumes than they are to U.S. CVs. With a few exceptions, they tend to be more competency-based than credentials-based. What distinguishes them from the career search documents used in the United States is that they often require personal information that it would be illegal for U.S. employers to ask for (because of anti-discrimination and other EEOC employment laws). When you’re applying for an international job, you’ll need to know the expected CV format and content required – and this can vary widely, depending upon the nation you’re targeting. A CV written for a job in the United Kingdom will be slightly different than one written for another country like Germany or Portugal. Include personal information. Like any resume or CV, include your name, address, phone number, and email address at the top. While some countries require you to include other personal information, such as your marital status or age, this is not required in the UK. You also do not need to include a photo of yourself (unless this is specifically requested by an employer). Include a personal profile. After you’ve provided your contact information, begin your CV with a one-paragraph professional profile summarizing your career goals and the skills you can offer an employer. Include all relevant work experience. Because a CV can be longer than a resume, feel free to include all relevant work experience in the “Employment History” section of your CV. Below the basic information for each position (the company, job title, time employed, etc. ), include a brief summary of your responsibilities and achievements. Include this in a bulleted list or in a small paragraph. Don’t feel like you have to limit your CV to only the last ten or so years. If you have relevant experience from further back, you have the option to include this (although it certainly isn’t required that you do so). However, it is not necessary to provide summaries and achievements for positions you held more than ten years ago – it’s enough to merely list the name of the employer, their location, your job title, and the dates employed. Write more than one page (if necessary). 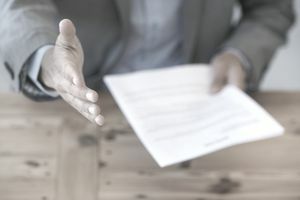 Most resumes in the United States are only one page in length (unless someone is applying for an upper-level position and has extensive experience). However, this is not the case for CVs in the UK. Your CV can be two or more pages. Of course, you only want to include relevant information in your CV, so don’t add information just for the sake of lengthening your CV. Also, avoid having only one or two lines on the final page of your CV. This looks messy; in this case, revise your CV so it fills out each page. Include related interests (optional). Some CVs for jobs in the UK include an “Interests” or “Interests and Achievements” section that includes hobbies outside of work. This section helps show your personality in the CV. However, if you include a section like this, make sure the interests you include are at least somewhat related to the position. For example, if you are applying for a job in outdoor education, you might mention in this section that you are a member of a rock climbing club. 1. Select the entire text of your CV, then open the “Review” tab. 4. Press F7 to have Word begin checking the spelling and grammar. 5. Make the prompted corrections. Proofread Carefully. Like any resume or CV, be sure to thoroughly edit your CV before submitting it to an employer. Proofread for any typos or grammatical errors. Also, make sure your formatting is uniform throughout the CV. For example, if you put one of the section titles in bold font, be sure to put all the section titles in bold font. Consider asking a friend, family member, or career counselor to look over your CV as well. Here is an example of what a CV written for jobs in the UK looks like. Download the UK CV template (compatible with Google Docs and Word Online) or see below for more examples. Versatile and creative professional positioned to excel within role requiring cross-functional graphic design, digital design, and website development talents. Well-versed in software technologies including Microsoft Office Suite and Adobe Creative Suite. Train end-users on how to use and operate software applications such as Word, Excel, and PowerPoint. Responsible for maintenance of hardware and software used for training purposes and recommending repairs to management where appropriate. Duties included creating web content, editing graphics, and writing copy for clients’ websites and promotional materials. Collaborated with cross-functional teams to design high-profile web content for companies including Spencer’s, Projekt Blue, and Global United. Monitored allocated order queues and assigned work from the relevant queues. Entered purchase orders accurately and promptly. Organized and filed paperwork, set up mailing systems, and processed backlogs of documents. Played key role in helping to set up and train personnel in new office software system.